Multi-Factor Authentication is a method of confirming a user's claimed identity in which a computer user is granted access only after successfully presenting two or more pieces of evidence to an authentication mechanism. Multi-Factor Authentication can be implemented from a portal login, on a per app basis, or conditionally upon risk assessment when required. Risk-Based Authentication measures risks based on factors such as the user’s location, IP address, browser settings, and hundreds of other metrics. If the factors are not what is expected, Authen2cate will require additional steps during the authentication process to ensure the user is authorized to access the application. By implementing Authen2cate’s unified Identity and Access Management solution, you can prevent identity attacks and data compromise with an added layer of security. 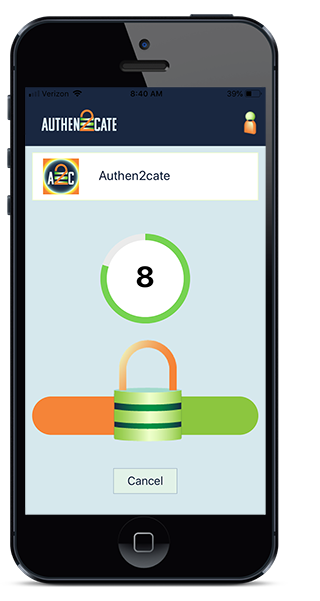 Authen2cate’s Multi-Factor Authentication enables your users to secure their logins and transactions via text, email, smartphone application, or phone calls. A2C Mobile is the most secure way to do Multi-Factor Authentication, and also the most cost-effective. Authentication using A2C Mobile is fast, convenient, and most importantly, secure. By implementing Multi-Factor Authentication, you can reduce risk, increase ROI, and meet compliance requirements, all while providing a seamless experience for the user.